In particular, you should read down this page which contains a lot more information about the Club that is useful to know before you join and when you have become a probationary member. We like to meet potential members before we take them caving to make sure they are fit enough and the right age to undertake caving as a sport. This doesn't mean there is no place for the youngest or the oldest, just that we can save you and ourselves a lot of time if we get to know you before you try a challenging trip. There are also plenty of other things to do that are less strenuous such as helping with open days, archiving, and even maintaining this website. 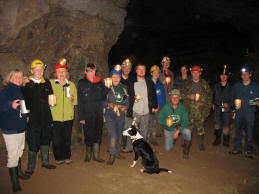 Keep in mind that most Club members live in the south of Lancashire, Manchester and Cheshire so that if you live further afield, it may be difficult to involve you in regular trips to caves outside our patch. Here is a list of a few future activities that might interest new members to the Club. The abbreviations indicate whether the event is caving (CAV), mining (MIN), other undergound trips (OTH), Alderley (ALD) or a club meeting of some sort (CLU). If you want to take this further, send an e-mail to the Secretary or complete the form below which does not require you to have an email address. You can even download and complete an Application Form to send to the Secretary but we do not advise doing this without getting to know Club members first. Applications have to be proposed and seconded by members who have met you and will support your membership. Special conditions apply for those under 18 and the adult form cannot be used for them: contact the Secretary. In the sections below, there are some links (shown like this) which require you to put in a password to read the private Club pages. If you are not yet a member, then we regret that you will have to wait until you have joined to get access to these. 2.1	To provide the facilities (including information and records) and organisation to enable members safely to participate in caving and in mine exploration and, where appropriate, to pursue specialist interests. 2.2	To encourage responsible exploration of caves and mines, the recording of discoveries and artefacts, and specialist activities including photography, surveying and historical research. 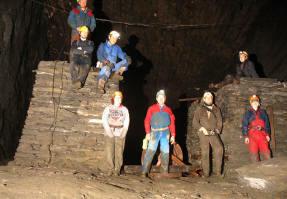 2.3	To support through membership as a Club the activities of the British Caving Association and National Association of Mining History Organisations and to encourage adherence to relevant guidelines of these and other appropriate organisations. 2.4	To lease the Alderley Edge Copper Mines from the National Trust and to manage the mines for the long term benefit of members, other caving and mining clubs, the National Trust, other organisations and the general public. 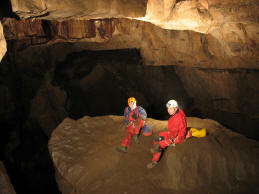 2.5	To foster a general interest in caving by lectures, publications and exhibitions, and co-operation with other organisations and individuals and by any other means deemed fit by the Club. Summarised, the Club could be said to be here to help people go caving through encouragement, training, provision of equipment and guidance on issues such as safety. and in addition to all of these, members have strong social ties with events such as an Annual Dinner, stomps and generally meeting up with each other and members of other clubs. The Club is run by its members through general meetings held six times a year. At the annual meeting in December, a committee is appointed to look after particular jobs or to agree actions where the whole Club does not need to be involved. The current committee has nine members with Tom Howard as Chairman, Ed Coghlan as Secretary and Nigel Dibben as Treasurer. These are the three main 'officer' positions on the committee. 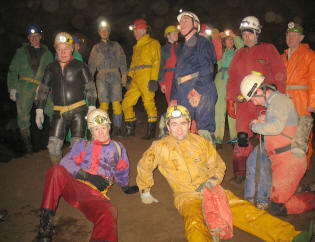 By far the best way to get involved with members is to go on caving or mining trips with others, preferably with a range of different people in different areas of the country. This way you will be able to understand caving and mining better and also, if you are still a probationary member, to stand up at a General Meeting and tell the other members where you have been before you become a full member. Trips are often publicised on Facebook and the calendar (click HERE for a fuller members' version) on this website. If you can read this, then you already have a club website password but you will need to ask to join the Facebook and Yahoo groups. The social life of the Club ebbs and flows but usually the year is marked by the two Open Weekends at Alderley Edge that attract cavers and miners alike and the Annual Dinner. Make sure you get along to these and the relaxed atmosphere will help you to get to know other members as well as their partners. To help you understand the Club better, you can read or download the latest newsletter and a bit of general information about the Club. Older newsletters going back to 1961 are available for Club members to read.. Even without being a member, you can also read some of the members' caving and mining log entries. There are also albums of trip photos. Get yourself known to two or three members to start with and ask them to help you find your way around. If they are all Alderley diggers or all cavers or all miners, get them to introduce you to other friends in the Club with different interests so that your choices are widened.